"I'm busy Saturday. I'm washing my hair and serving God." 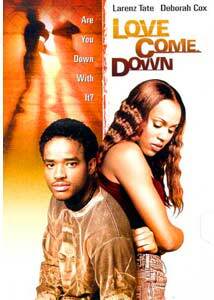 Right from the start, it's clear that Love Come Down is going to be a trying film to sit through. It begins with the hero/narrator, Neville, performing onstage at a comedy club. Except he's really providing his inner monologue for the film, and the device, as poorly done as it is, feels self-indulgent before a few frames have passed. Neville (Tate) is a recovering drug addict with a conflicted past (is there any other kind?). He is black; his mother is white, as is his half-brother Matthew (Cummins). His father, a Jamaican immigrant, is dead, murdered by his wife. The story unfolds elliptically, with the sordid events of the family's past revealing themselves randomly as Neville deals with his vices in the present, and it becomes clear, through various parallels, that escaping the past is going to be a Big Theme throughout. I'm all for a script that shucks Hollywood convention, and the free flowing movement of time in writer/director Clement Virgo's screenplay does much to distance itself from some very familiar subject matter. He doesn't handle the material all that well as a director, however, and the intermittent flashbacks are accomplished through frequent use of freeze-frame, voiceover, and, all too often, pauses in the narrative flow that allow Neville to directly address the "audience" in the comedy club (us, as it becomes clear that Neville always auditions for the clubs but never makes it onstage; it's all in his head). It's not that I dislike a stylishly shot and edited film; it's that here, the techniques are clumsy and often illogical, and they distract from the narrative much more than they serve it.The cast is made up mostly of amateurs, with leading man Larenz Tate not up to the task of carrying a film. He isn't nearly charismatic enough, for one thing, and he never strikes me as the fireball type who would want to go into standup comedy in the first place (it doesn't help that the "jokes" that he performs during both the narrative breaks and the frequent in-films auditions he attends are little more than sexual innuendos and racial barbs). Martin Cummins, as his older brother, makes little impression with a poorly defined character; much of his emotional arc is confined to flashback scenes where a child actor handles the role. R&B artist Deborah Cox makes her acting debut as Neville's love interest, and she's fine, but her frequent musical interruptions (she sings at the nightclub where Neville wants to perform) seem unnecessary. Sarah Polley, usually a very good actress, gives a bizarre and somewhat creepy reading of the nun who nurses Neville back from the brink of addiction, but the tone shifts so wildly throughout that she doesn't really seem all that out of place.Love Come Down is a very simple story, dressed up with a lot of flash and razzle-dazzle directorial tricks, but it fails to impress, as the ideas feel always half-formed, and the stylistic flourishes halfhearted. It's an admirable attempt, perhaps, but certainly not a final product worthy of admiration. Image Transfer Review: There's no telling what the OAR of Love Come Down actually is, but since it played theatrically at a few festivals, I'll assume it isn't 1.33:1. That said, the picture here looks pretty good anyway. The constant use of filters and odd lighting means that the source material is sometimes problematic in terms of color balance and fleshtones, but the transfer seems to fit the director's intent for the most part. Blacks are solid, but lacking in shadow detail. Some aliasing is evident here and there, but I noted no artifacting. Slight edge halos can be spotted in brighter scenes, but they don't present much of a distraction. Most glaring is perhaps the amount of visible grain, but I believe it actually adds to the film-like appearance, as long as it doesn't result in a lot of pixilization. Audio Transfer Review: This fairly limited DD 2.0 mix gets the job done and nothing more. Audio is confined to a somewhat expansive front soundstage, with dialogue always audible, but sounding a bit muffled at times. The front mains fill things out with a few sound effects and the score, and the scattered club scenes, complete with loud techno music, bring in a bit of LFE. There aren't any instances of panning or directional effects, and I'm surprised the director didn't get as fancy with his sound mix as he did with his visuals. Extras Review: Extras are limited to the trailer and Spanish subtitles. I give Clement Virgo credit for trying Love Come Down, but his overuse of distracting stylistic devices does little to serve the overly self-conscious screenplay. For a direct-to-video release, it isn't bad, but I can't really recommend it.